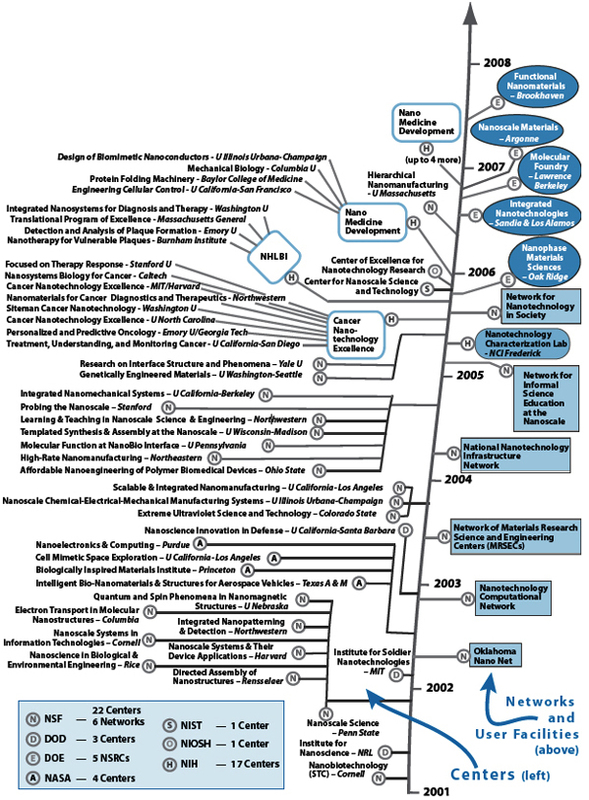 (Nanowerk Spotlight) The just released 2007 National Nanotechnology Initiative (NNI) budget request is $1.28 billion, slightly less than the 2006 estimated spend of $1.30 billion. The 2007 numbers would bring the overall NNI investment since its inception in 2001 to $6.6 billion. The lion share of this amount, $2 billion or 30.3%, went to the Department of Defense (DoD). In 2006, the DoD's share even reached 33.5% of the entire NNI budget. The National Nanotechnology Initiative (NNI), now in its sixth year, is a collaborative, cross-cutting program among 25 U.S. federal agencies, 13 of which have budgets for nanotechnology R&D. Even the Forest Service has joined the NNI budget fray, with a budget request for 2007 of $2.1 million focused on applications of nanotechnology to enhance utilization of forest resources and research on low-cost forest product feedstocks for nanomanufacturing. The annual NNI budget is distributed across these 13 agencies. Funding under the NNI supports a broad range of R&D, along with a geographically distributed infrastructure of research centers and user facilities. 77% of the entire NNI investment from 2001 to 2006 went to only three agencies - the DoD ($1,655 million - 31%), the National Science Foundation ($1,513 million - 28.4%) and the Department of Energy ($930 million - 17.5%). Again, almost 77% of the 2006 estimated total spend of $1.3 billion goes to just three areas: PCA 1 with $419 million (32%), PCA 3 with $297 million (23%) and PCA 2 with $279 million (21%). The historical shares are similar. The overall drivers for the NNI remain the same for 2007. The numbers of centers and user facilities in operation is approaching 60. Existing centers, networks and user facilities continue to expand their user base. The full report "The National Nanotechnology Initiative - Supplement to the President's 2007 Budget" is available on the NNI website.